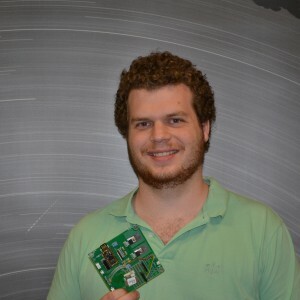 Robert Howie started working on the Desert Fireball Network when he started his PhD in 2012 after completing his mechatronic engineering degree. He’s working on the new digital meteor observatory cameras and developing a new meteor spectrograph to acquire compositional data on meteors that do not reach the ground as meteorites. Robert enjoys working on the Desert Fireball Network because there is a good mix of work, from programming in Perth to off-roading in the outback. When he’s not flashing microcontrollers or putting together meteor camera equipment, he’s into aquariums, photography and other geeky pursuits. View Rob’s presentation about how he developed the DFN cameras here. Robert holds a circuit board which forms an essential part of the control system for the DFN cameras.